Archived 2010 – 2011 ← Heartstrings! Sponsered by the PG Library, supported by volunteers of the Friends of the PG Library. All proceeds will go to the Children’s Collectionb of the library. Joint Heartstrings for this special Valentine’s Fundraiser! On Saturday, November 13, 2010, from 6:00-8:30 p.m., Monterey State Historic Park, the Monterey State Historic Park Association and the Robert Louis Stevenson Club of Monterey will present a magical evening of Celtic Music with favorite Monterey Peninsula Musicians ‘Heartstrings’. They will perform a Celtic music program including some of their favorite Scottish tunes to celebrate famed Scottish writer, Robert Louis Stevenson’s “Unbirthday”. Don’t know what the Stevenson “Unbirthday’” is about? Plan on attending to find out! Since 1992 Heartstrings has been performing an inspired blend of folk and traditional music from around the world with a few contemporary surprises slipped in. 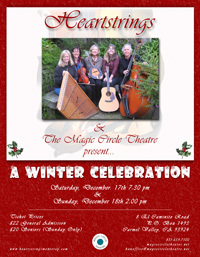 ‘Heartstrings’ performers Laura Burian on violin, Paulette Lynch on hammered dulcimer and percussion, Pat Skinner on mandolin, mandola and accordion, and Marj Ingram Viales on guitar. The Heartstrings will be joined by Rick Chelew on bass. For more information, please call (831) 649-7109. Hearstrings will be performing at the Unitarian Universalist Church on Sunday, September 26 from 3 – 5 p.m. Kids under 12 – FREE!! In keeping with St. Pat’s tradition, Heartstrings Monterey will be performing primarily Irish tunes, but also some other irresistible fiddle tunes from around the world. Join us Saturday, March 13th from 7 – 9 p.m. at Plaza Linda Mexican Restaurant & Cantina (9 Del Fino Place, Carmel Valley, Tel: 831-659-4229 for reservations). Cover charge is $10, and dinner is wonderful if you choose to dine. Details online:http://plazalinda.com/ and http://plazalinda.com/1Mar10.asp Call for reservations! Happy St. Patrick’s Day to all of you, and hope to see you soon!